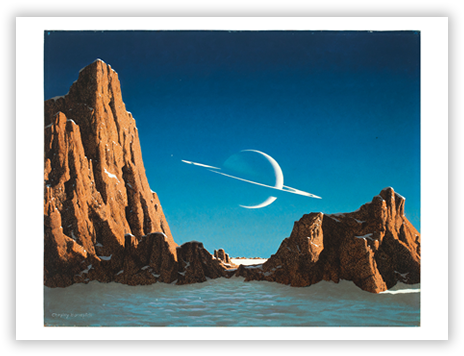 To commemorate the 70th anniversary of the inaugural publication of Bonestell's space art, Bonestell LLC is releasing 250 limited edition art prints of Saturn as seen from Titan. The last official printing of Bonestell's Saturn as seen from Titan was in the 1970s. Chesley Bonestell's space art first appeared in the May 29, 1944, issue of Life magazine, accompanying the article, "Solar System: It is Modeled in Miniature by Saturn and Nine Moons." The article featured a series of paintings – including Saturn as seen from Titan – depicting views of Saturn from its various satellites and presenting the audience with a realistic and magical impression of Saturn and space. Thus began the era in which Bonestell's art provided a window to explore space in magazines such as Collier's, Fantasy and Science Fiction, Life, Pic, Coronet, Scientific American, and in books such as The Conquest of Space and The Exploration of Mars. Saturn as seen from Titan became one of Bonestell's most iconic paintings. It is also one of the paintings he would paint again and again, the view evolving with time. The print for purchase is a version he created in 1952 for his daughter, Jane Webster. It was first exhibited in the Griffith Observatory in Los Angeles, October 1957. While its second and last exhibition was in 1988 at the California Academy of Sciences. The print was released on June 11, 2014. This date is significant: Chesley Bonestell passed away on June 11, 1986, doing one of the things he loved most – painting. To learn more about the painting's different incarnations, read Ron Miller's essay, "The Evolution of a Space Icon." Miller co-wrote "The Art of Chesley Bonestell," and is a best-selling author and award-winning artist. Chromira photo print on Fuji Crystal Archive paper. Prints are numbered and stamped with Bonestell LLC's official stamp. Accompanying the print is a Certificate of Authenticity from Bonestell LLC.